The Public Policy section is designed to provide the resources and tools needed to implement public policy events and activities across Pennsylvania. Look at all the pages under Public Policy menu. 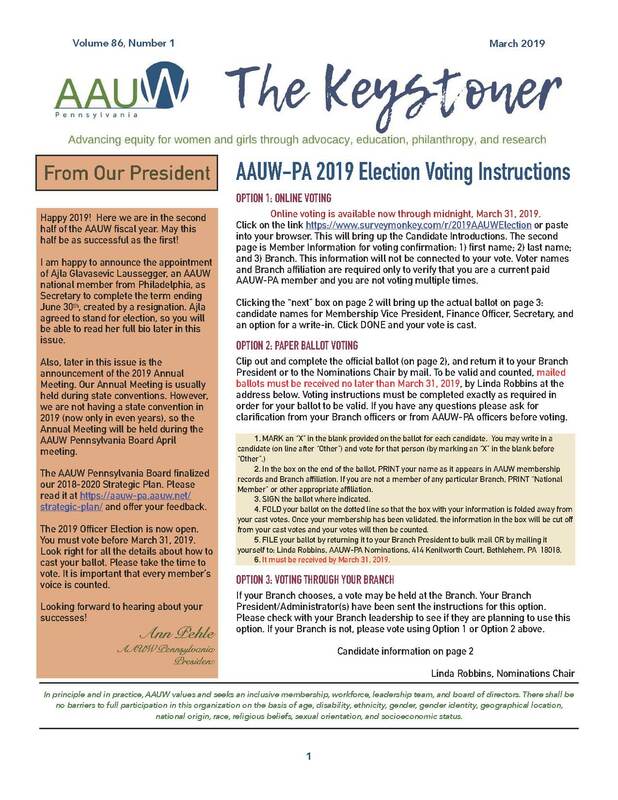 AAUW-PA Public Policy is managed by Public Policy Co-Chairs Barbara Price (aauwpapp1@gmail.com) and Kim Hoeritz (aauwpapp2@gmail.com). The role of AAUW-PA Public Policy Co-Chairs is to: Represent AAUW Pennsylvania in coalitions; Manage state-wide public policy initiatives; Assist Branch Public Policy Chairs (BPPC). On June 6, 2018, Pennsylvania Governor Tom Wolf took action on pay equity by signing an executive order that ends the practice of state agencies requiring a job applicant to provide their salary history during the hiring process. Clearly explain the pay range on job postings. 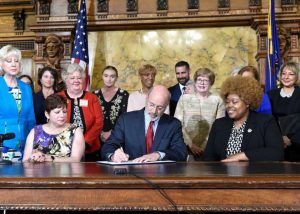 The governor also called on the General Assembly to pass similar protections for all working women in Pennsylvania. AAUW Pennsylvania was honored to be included in the ceremony. Barbara Price, AAUW Public Policy Co-Chair, made moving remarks. Watch Barbara in this video, beginning just before the 20 minute mark. AAUW Pennsylvania was the only organization to speak. 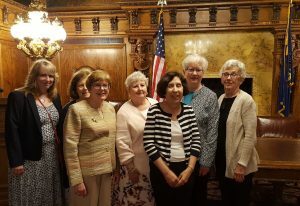 Several AAUW Pennsylvania members, instumental in the equal pay efforts over the past four years, attended this special event. Reliance on salary history can contribute to and perpetuate the pay gap many women and people of color face in their careers. When employers ask job candidates about their previous wages and use that information to set pay in a new job, this seemingly innocuous practice can have major repercussions. Wolf joins the governors of New York and New Jersey and the mayor or New Orleans in taking executive action to ban reliance on salary history for state/city employees. A growing number of states and cities have also taken legislative action to end the practice. On Thursday, June 15, 2017, the Pennsylvania delegation of twenty-three members from across the state met with legislative aides of Senators Toomey and Casey. In the afternoon, every member met with her Congressman. We visited nine–Boyle, Cartwright, Dent, Fitzpatrick, Meehan, Perry, Rothfus, Smucker,Thompson. On Wednesday afternoon we attended a briefing to learn about the lobbying topics and plan our strategy for the next day. Dressed in our AAUW Lobby Day t-shirts and Liberty Bell pins (so everyone would know we were from Pennsylvania) we boarded buses Thursday morning for a long day of talking about the issues, laughing with each other, and walking. Best stories from the day. 1) At the (almost) conclusion of our meeting with an aide in a conference room, Senator Toomey walked in from a connecting office and was surprised to see the room occupied. Surprised the conference room wasn’t empty! 2) While talking a photo of the plaque outside Congressman Rothfus’ office, 40 minutes prior to the scheduled meeting,he walked out of the office on his way to the floor for a vote, recognized Janine was from AAUW (t-shirt said it all) and asked what she wanted to speak with him about–so she told him. 3) Seeing so many people in AAUW white t-shirts everywhere you went. 4) Being stopped by passersby to talk about AAUW. A young woman stopped Betty and Ann in front of the Cannon building–she is a student member from Minnesota in D.C. for a summer internship and was thrilled to see all the AAUW members on the Hill. Title IX is turning 45 on June 23rd, yet more work remains. We asked for the Senator’s support for increased funding for the Department of Education’s Office for Civil Rights to continue their vital work to ensure schools comply with our civil rights statues, including Title IX and its current regulations and guidance. AAUW is known for groundbreaking research and our just released research, Deeper in Debt: Women and Student Loans is no exception. We asked for support protecting and strengthening federal financial aid programs such as Pell Grants, Public Service Loan Forgiveness, and Income-Driven Repayment. These programs are critical to the success of women in higher education and can help to curb the student debt burden they experience. The first AAUW Lobby Day was in 1989 at the 35th AAUW National Convention, where the theme that yearwas “Choices, Changes, and Connections.” Read more.